Ever since entering the league, Josh Gordon has had issues with substance abuse which have kept him from achieving his true potential. Gordon has missed entire seasons due to his vices and was even traded from the Cleveland Browns because of them. As a member of the New England Patriots, Gordon found some early success but once again, he violated the league's substance abuse policy and was suspended indefinitely. The Patriots organization, including owner Robert Kraft, have stated that they are willing to do everything they can to help Gordon on his road to recovery. Gordon himself seems pretty keen on coming back though, as according to TMZ Sports, sources close to Gordon are saying that the receiver is going hard in the gym right now and is even training with former Olympian Tim Montgomery. Montgomery was a sprinter who won gold at the 200 Olympics in the 4x100 event. Sources say that the two have been training 6 days a week for multiple hours a day just so Gordon can get into playing shape. 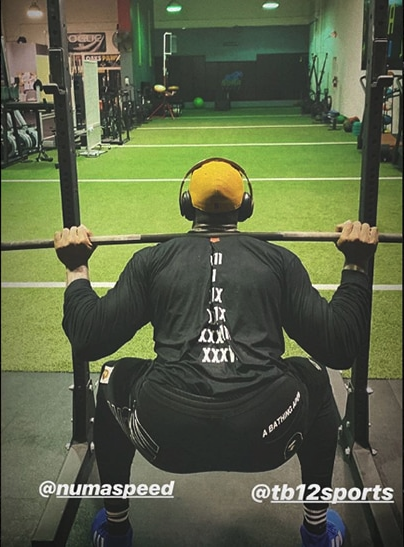 It's uncertain when the league will reinstate Flash, but regardless, it's just good to see Gordon working out again as he appears to be in a positive space.